This is both a rattle and teething toy! 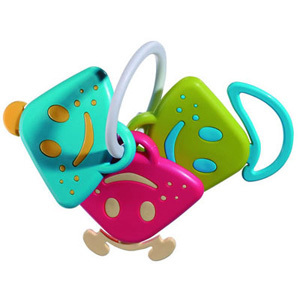 Combining flexible and rigid plastic, this rattle is ideal for chewing. Lots of activities to discover: 3 heads shaped keys to shake up, bright colors, plastic materials mixed to develop the sense of touch, textured teething parts. Easy to grasp and grip. You can rest assured that your baby is chewing on a BPA Free teether - rattle and that it is absolutely non-toxic and BPA Free.